Although my inner child may be impatient and clueless at times, it’s my inner 30-year-old who has the most need for caring and encouragement from her future self. Just getting her to sit down at the table with a cup of tea required some coaxing, as with a skittish animal. Truth be told, she didn’t even have any tea in the house, as she had been staying home with small children for the past few years and had nearly forgotten how to take time for herself. So I brought along some calming honey-chamomile tea during my imaginary visit, along with a big copper teakettle for the soothing old-fashioned ambience. When the teakettle started whistling, she turned a rather alarmed glance toward the kitchen from where she was nervously pacing in the hall, perhaps worrying that the noise might wake the baby. But all was quiet when I took the kettle off the stove; and eventually, when I had brewed the tea and set two cups on the table, she felt safe enough to sit down across from me and take a small sip. 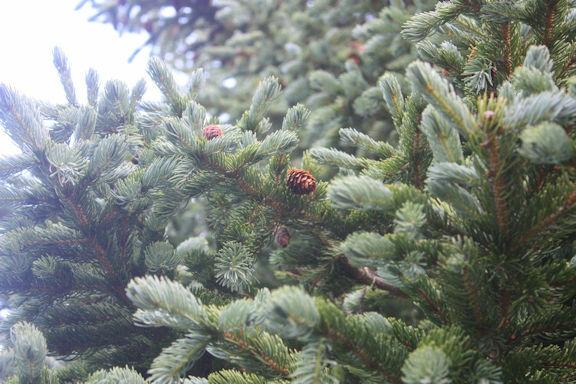 Just outside the dining room window there was a lovely mature blue spruce. I couldn’t find any pictures of it, though. My 30-year-old self was too frazzled to give much thought to taking photos, and the primitive technology made it harder—no digital cameras or smartphones. Anyway, it was a beautiful tree, and I opened the window to let in the scents and sounds of nature. The younger face across the table still looked anxious, even after we sat down to tea. She was always finding something to worry about—if it wasn’t the children, it was fear of being judged for not having a job, and how hard getting into the job market would be after several years at home. An afternoon tea break wasn’t nearly enough time to address all of her issues, but I could leave her a few thoughts to ponder. “It’s a them problem,” I declared, firmly setting down my teacup for emphasis. She gave me a puzzled look; evidently she hadn’t yet heard that expression, and wouldn’t have known what to make of it anyway. Ignoring criticism never had been her strong suit. She tended to take it much too seriously, brooding over random remarks long after everyone else had totally forgotten what was said. A bright flash of wings rose from the spruce branches as a small bird took flight. My younger self breathed deeply, holding the teacup between her hands to absorb its warmth. I thought I saw the tension in her face relax a little; but I also knew that this lesson would take many years to understand.